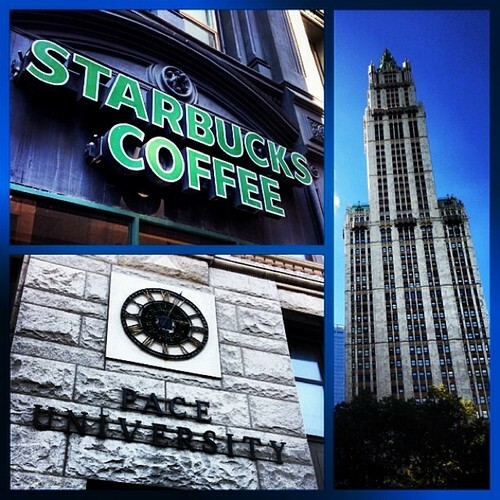 After visiting the Starbucks just outside of Columbia University in Morningside Heights yesterday, I decided today was the day to infiltrate the Starbucks inside Pace University near the corner of William and Spruce. You see, I’ve recently discovered that certain Starbucks are actually off-limits to the general public. Most are in office buildings, but some are actually inside college campuses. 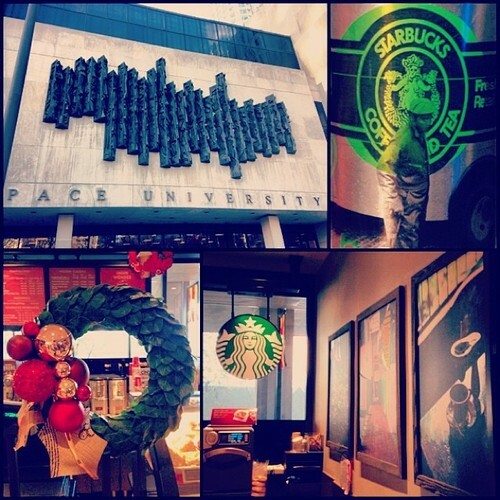 Earlier this week I went looking for the Starbucks inside of Pace University, only to be turned away by a campus security guard. So, I knew today I had to be a little more persuasive. Well, that’s not entirely true, I just dressed like an undergrad would on a Sunday and asked the front desk security where the Starbucks was. Regardless — it worked like a charm! Unfortunately, the Starbucks itself is completely lacking of charm. Not only were the baristas rude (see description below) but the Starbucks itself is simply one of many restaurants inside a small campus food court. There’s no Starbucks WiFi and no comfy chairs. There’s just a cafeteria-esque environment of young Pace students grabbing lunch and a midday pick-me-up. I know they say our college years are some of the best of our life, but I really beg to differ. The past two days of being around undergrads from both Columbia and Pace got me thinking. And I can honestly say that the best years are those that follow your graduation. That’s when the messy mold that formed in college begins to harden and you get to see just who you are and what you want to do in this life. This is completely unrelated to the Pace University Starbucks, but some of you may recognize the image in the top-right corner of this blog entry’s photo. It’s Starbucks new holiday tumbler and it costs $75! Why you ask? Well, besides an artistic design — it also gives the owner a free handcrafted espresso beverage every day in January when you bring it into a participating Starbucks. So for those of you who really love their lattes, this may be the perfect tumbler for you. Or if you know someone who can’t get enough Starbucks, this would also make an excellent Christmas gift. It’s even going on sale for $65 on Black Friday. If you do the math, anyone who purchases it and uses it daily in January, will get their money’s worth well before the month ends. Unless of course your New Years resolution is to give up caffeine. I really, really wanted to give the Starbucks on Beekman and Park Row a rating of 5. I did. It’s large. It’s well decorated. It’s in a great area of New York. And it’s very accommodating. Unfortunately, for all the good there is just as much bad. Ultimately it can be summed up to the simple fact that there are too many people in this Starbucks. Too many in line, too many smooching on the WiFi and too many trying to use the single restroom. Thankfully there’s enough seating to support the crowd. 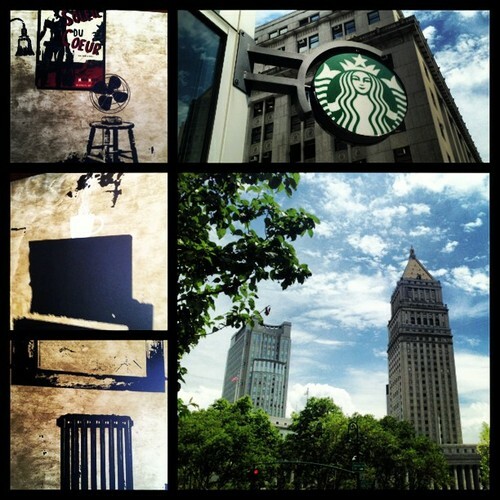 This Starbucks is located in the small Civic Center neighborhood of Downtown Manhattan. It’s right near Pace University and directly across from City Hall Park. So inside the crowd is a good mix of studying college students and tourists looking for a pick-me-up. After all, this is a beautiful neighborhood with plenty of transportation options. Today is one of those days that you feel stupid the moment you ask “What’s the date?” aloud. Twelve years ago today, America was forever changed by the tragic and horrific terrorist attack known now as 9/11. Everybody — over the age of 15 — has their own story to tell about what they experienced that day. Living in Florida at the ripe age of 12, my story is more muted than most. I remember being in 7th grade homeroom class, when an announcement came on the overhead for all teachers to turn on the news. I remember seeing the second plane crash into the South Tower. And I remember hearing the word terrorism for the first time. Now, living here in NYC under the shadow of the Freedom Tower, I often wonder what it was like for New Yorkers on that day. I remember being stunned at how close the Freedom Tower appeared to my former apartment in the West Village. This is a small island — full of connections — and I can’t imagine the unadulterated panic that went through every New Yorker on that day. This Starbucks on the corner of Dey and Church Street is actually addressed 195 Broadway. The 29-story sky scraper that encompasses the Starbucks is pretty historic. It once served as the headquarters for the American Telephone and Telegraph and is the site of the first transatlantic phone call. The Starbucks contains quite the crowd — which I’m sure is comprised of half businessmen, half sightseers. But the construction of the Starbucks — both interior and exterior — is very appealing, and the line moves quickly. Not to mention, it’s extremely close to most trains. 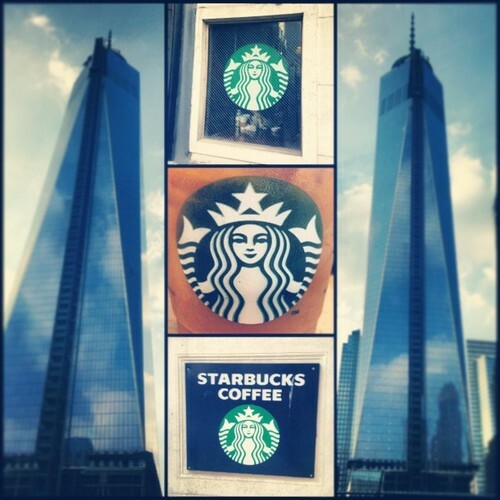 And, from the spot directly outside of the Starbucks’ entrance, one can see a picturesque view of the Freedom Tower. All in all, this Starbucks may be just average, but its location is one I will never forget. I’m starting to appreciate the neighborhoods in Lower Manhattan the more I visit them. Not only are they older than the upper part of the island and rich with history, but they also have a more pleasing aesthetic Perhaps it’s the fact that they don’t obey the repetitive Manhattan grid of numbered streets and avenues. Down here streets run diagonal or even in circles, and they actually have names that have nothing to do with their placement. Sure it’s not logical or organized, but this lack-of-symmetry allows for a more substantial presence for each of these beautiful buildings. Today, I walked south from 14th street, past Astor Place, through SoHo and Chinatown (passing countless Starbucks on my way) until my feet had had enough and I came across a Starbucks that I had yet to venture into. The Starbucks I found was on the corner of Worth and Lafayette in an area of Civic Center called Foley Square. The Department of Health and the New York Supreme Court are both nearby, and the though the windows of the Starbucks you get a lovely view of Thomas Pain Park. Inside the Starbucks, there is a small seating nook that is well-enough removed from the barista bar and line to still be considered nice and relaxing. It gets plenty of natural light and has a just enough seating to satisfy the few of us that actually want to stay and sit a while. Most people, however, seems to want to get their drinks to go. The line was consistently backed up to the entrance, and although the baristas kept it moving, there was always just as much people entering as there was leaving. Anyone who’s ever visited New York City knows Duane Reade. The city practically runs on this hybrid pharmacy and convenience store. 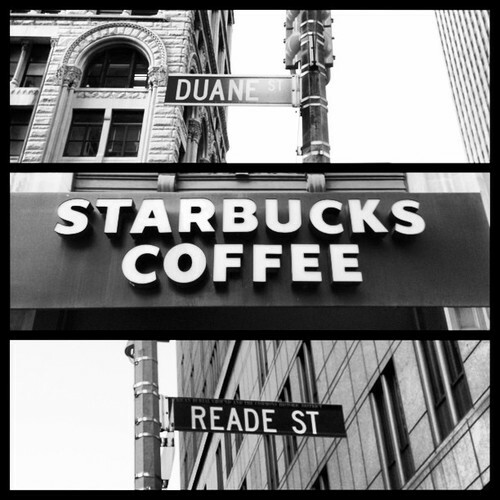 With over 150 locations in NYC, you see almost as many Duane Reades as you do Starbucks. 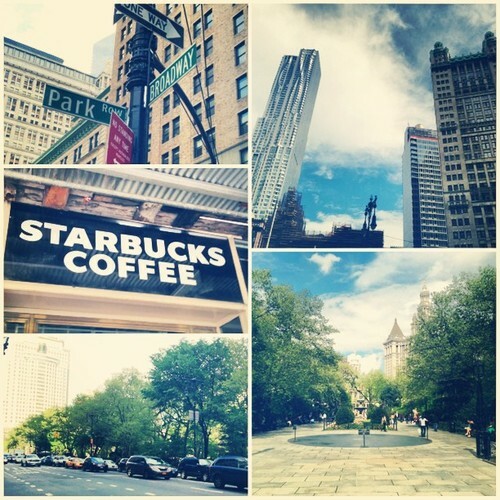 And today I happen to be sitting at the Starbucks in Lower Manhattan between Duane street and Reade street. My first thought: Oh, now the name makes sense! Duane Reade has been around since the 60s and is unique to New York — even though it was recently purchased by Walgreens. The original Duane Reade and its warehouse started right here on this street corner on the borders of Civic Center and TriBeCa. The rest is history. So there’s your brief history of NYC’s most frequented convenience store — now its most frequented coffee house. Today my caffeinated journey took me to a new Downtown neighborhood — Civic Center of Manhattan. This small neighborhood is the municipal heart of NYC. It surrounds the beautiful City Hall Park and contains city hall (obviously…), the courthouses, and the police headquarters. It is also a few blocks north east of the World Trade Center and 911 Memorial. For being in one of the many hustle and bustle parts of Manhattan, I have to say this Starbucks can handle the crowd just fine. Of course there’s a congestion of low-headed individuals waiting for the 1 restroom near the entrance, but that’s just the NYC norm. Past that, this Starbucks contains a plentiful amount of seating (which is only 3/4 full during business hour rush) and some pretty adorable decor. The music is a blast from the past (70s and 80s), but they seem to have the volume up a tad too much. And there are outlets in the building — they just aren’t conveniently located near the majority of seating.